Markus Linnenbrink was born in Dortmund, Germany in 1961. He attended the Gesamthochschule in Kassel from 1982-85 and then the Academy of Fine Arts, Berlin from 1985-88. 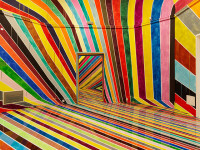 Linnenbrink’s paintings are known for their bright, glossy colors and layered appearance, frequently depicting stripes or dots to cover the canvas’s surface. He lives and works in Brooklyn, New York.